I’m going to keep this preview short since there is a demo available, at least for PS3, and people reading this article have a good chance to play it for themselves. For those of you without next-gen consoles, let me fill in the gaps. The game promises to be the “worlds largest racing environment at over 14,000 km squared created from satellite data”. It apparently represents some region of North America that I couldn’t makeout from the game. A lot of these types of racing games have very short words to describe their racing: DIRT, GRID, PURE, FUEL, ect. The story surrounding the game is not well defined, but I’ll just assume that there are a ton of scavengers who decide to waste their precious FUEL to fund races through badlands. I fired up the demo at a friend’s home at chose the race option, whatever it was named. The first thing I did was go into person and vehicle customization. There were not many options available in the demo, so I moved on to the first race. I had to choose Expert difficulty since that’s how I roll. After a brief loading screen, the game shows the other bikes already lined up ready to race. There is a brief cutscene of a huge transport helicopter flying in with my character and motorcycle attached by wires. 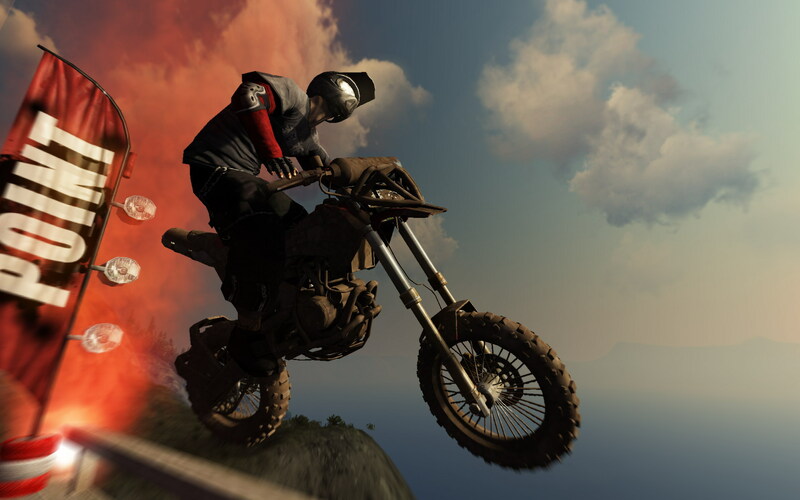 The helicopter drops off the motorcycle in midair. Again, this just shows how crazy people are in this world for such a gaudy entrance. None of the other racers got their own helicopter, why does my character deserve one? It’s not like I couldn’t drive up there on my own. My guess is that you can somehow select races from anywhere in the world and that the helicopter transports you there directly. The race started and made clear that you can find your own path to the checkpoints. I decided to go off-road for most of the race because I don’t like roads. At one part, there is a burned forest where a few fallen trees are still on fire. Using the side of the trunk, my bike used it like a ramp and got some good air. There seems to be some sort of automatic trick system that doesn’t affect the race. Most of the tricks were very similar and I had no control over performing the tricks. I can see people playing online finding the optimal path and never deviating from it. 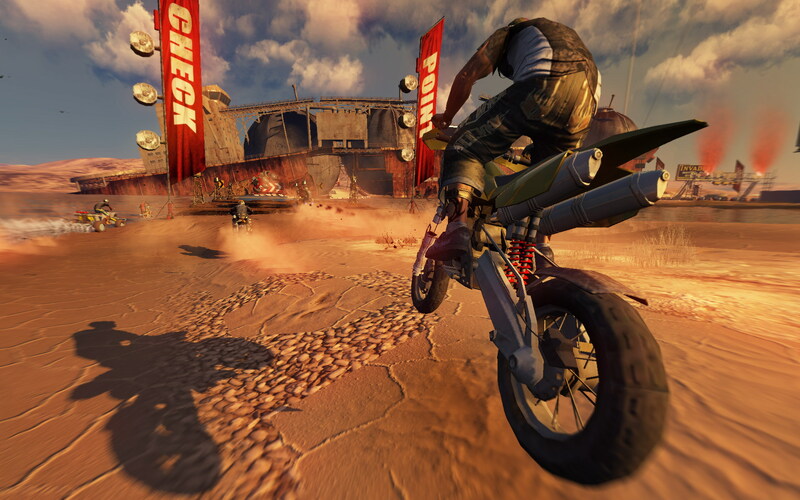 This was the problem with Motorstorm and one of the reasons why it became boring online. I would have liked to see a random landmass generating feature since the loading screen says something like “generating world”. Most of the race I was 7 / 8 because I was testing out the game. When I was able to get into 3rd place, all the other drivers were able to pass me right before the finish line. There is a strong rubberband system in place so that if you are way behind, there is a chance that you won’t get last. If you are in the front, there is nothing stopping the bikes from zipping past you on the straightaway at the finish line. Since I knew I wasn’t going to win, I decided to go around the finish line and drive into the person on their bike celebrating their victory. I was almost able to drive them off into the water, but ended up there myself which just equals a respawn. Once I completed the race, I had the option to do a free roam of the world. This is a little misleading since this is a demo and there were parts of the world that I wanted to explore, but were unable due to the world getting too yellow. The area I was trying to go to was a small island looking landmass that I should have been able to reach if the game didn’t have artificial limits. I bet that in the full game I wouldn’t have been able to access this area either since I wasn’t running into the demo’s red box on the map. There were a lot of snowtrucks driving around. They seemed to have no purpose other than to suggest that the world was not apocalyptic. I didn’t see any of that amazing weather that the game was hyping in the demo. No weather = no tornado ripping things up = disappointment. The max speed on the bike was around 80 MPH. It was a little unrealistic to be going around 70 MPH and not falling off the bike as my character went off sheer cliffs. This game really could have benefited from boast. That would have FUELed my interest more. I would have liked to see some destruction and more use of physics. I didn’t really get a sense of vehicle damage since I mainly played the bike. Being the biased person I am, there wasn’t enough excitement during the race; I had to make my own fun like always.